The City of Bellingham offers two programs to assist rental owners in maintaining their properties. One provides loans for repairs of rentals and the other a means to keep rentals crime free. "The purpose of the City of Bellingham Rental Rehabilitation Program (RRP) is to assist qualified investor owners of rental properties located within the City limits to rehabilitate existing units and to increase the supply of rental housing stock available to low and moderate income families." RRP details can be found on the City of Bellingham website by clicking here. For additional information you can phone Lisa Manos at 778-8391 or send an email to her at lmanos@cob.org. The Crime Free Multi-Housing Program is part of an international program that began in 1992 and is now available in over 40 states in the US. In spite of its name, the program is also available to owners of single family rentals. From the city's website is this, "The Bellingham Police Department coordinates the training for the Crime Free Multi-Housing Program. It consists of an 8 hour training session presented by representatives from police, local screening companies, landlord-tenant attorneys, and fire. Its goal is to provide a comprehensive approach to reduce crime and improve the quality of life in rentals. A certificate is awarded upon the completion of the 8 hour class. Rental owners and managers benefit greatly, learning how this program can increase profits and prevent crime too!" You can find information on this program by clicking here. You can also call Officer Mark Young at the Bellingham Police Department at 778-8618 or send an email to myoung@cob.org. The Zonemaven finds it interesting that on one hand the city offers these programs to rental owners in recognition of problems having to do with the condition of rentals while the Mayor contends that there is no need for rental licensing and inspections for health and safety reasons. As Bellingham ponders licensing and inspection of rental properties, the City Council and the Mayor ought to consider the longer term, fiscal ramifications of such a program. College Station, Texas, home to Texas A&M University, is considering licensing of rental properties. (Click here, here and here to read about these efforts) My contact provided me with information from a certified public accountant in that city who spent 22 years auditing tax returns for small businesses. He concludes that the "operation of rental properties on established, single family neighborhoods [is] a transfer of wealth from owner/occupant to investor/landlord." He opines that over the long run, incursion of or conversion to rental properties leads to decreased property values. Poor property maintenance degrades curb appeal of these properties and one can only wonder about the condition of the rental inside when the outside is not cared for. There is a decrease in asset value that erodes the tax base for the local jurisdictions. There is a concomitant loss of quality of life for the nearby homeowners due to noise, additional traffic, and an unstable resident population. The tenants can also suffer from poor rental conditions that are hazardous to their health or downright dangerous. Even the landlord can lose at sale time as the value of his asset is equally degraded by surrounding rentals that are not kept in good condition. He goes on to say, "But the biggest loss of property value is suffered by the owner/occupant in the neighborhood. Due to the federal tax treatment of the owner's personal property, he suffers a double whammy. Any losses by the owner/occupant due to the decrease in the value is not allowed, as a tax loss at any time (usually at the time of sale). On the other hand, the investor/landlord, while generally realizing a positive cash flow covering out of pocket expenses, can additionally deduct for tax purposes all depreciation, interest, taxes, insurance, management fees, etc. etc. This invariably allows a tax loss from the rental properties that can offset other taxable income from wages or passive income up to the losses plus $25,000. The result to the investor'/landlord is a cash savings in federal taxes year after year regardless of any general decline in asset value." He continues, "The result of the rental activity in the established neighborhood is a general decline or reduction of asset value in the absence of any real estate boom. The owner/occupant suffers a general uncompensated loss in asset value while an investor/landlord realizes a decrease in taxes paid year after year resulting in a transfer of wealth. Since it is outside our ability to correct the inequity of the federal tax code, in the interest of all concerned, the value of property should be protected by whatever means possible." Given the tax treatment of rentals, any argument that rental properties are not a business becomes ludicrous. All businesses in Bellingham are licensed with the exception of rental properties. Even landlord associations refer to themselves as the "rental industry." It is time to license this industry and to inspect its units for the health and safety of the renters and to ensure that the rental stock does not degrade property values and erode the tax base. The Viking Community Builders of Western Washington University (WWU) are sponsoring an on-line survey of renters in Bellingham to gather information on the condition of the more than 17,000 rental units in the city. If you are or have been a renter (student or non-student) in Bellingham, you can take the survey by clicking here. The survey is an extension of actions taken last spring by the Associated Students of WWU who published a resolution supporting licensing and inspection of rental properties. You can read the resolution by clicking here. Each year over 8,000 of WWUs student body rent off-campus. These renters should be able to provide a picture of the conditions of these rental properties. The Planning/Neighborhoods and Community Development Committee of the Bellingham City Council met in work session on 27 October to discuss the issue of licensing and inspection of rental housing. Committee members are Terry Bornemann (Chair), Jack Weiss, Michael Lilliquist and Seth Fleetwood. You can read the agenda item for the meeting by clicking here. The Zonemaven attended the work session, after which he sent the following missive to the committee members. There seemed to be several discernible areas of discussion at your 27 Oct work session on rental licensing in Council chambers. I would like to comment on each. I might add that neither the landlord nor the tenant is aware of many life threatening conditions. Education as an approach: I am interested in the methodology that the Council might employ to educate the tenants of 17,000 rental units. Even if there were an efficient and inexpensive method to reach all of these people at least once, what level of expertise on the condition of properties might one impart to this highly varied group? (Not only that, each year Western Washington University alone deposits about 4,000 new renters into our neighborhoods as the freshman class leaves the dorms.) This educational approach is no more than a close corollary of the complaint based system for it depends entirely on the tenant to move forward on a complaint after finding (with every limited knowledge and skills) a hazardous condition. I refer you again to the CDC report. As for educating landlords, the same condition applies. How does one educate a property owner sufficiently to identify serious or hidden defects in a rental unit? Nevertheless, the self-described “rental industry” claims that there are only a few bad apples, although the manner in which they have come to this conclusion is not evident not having had any training. If they have some information about these bad apples, let them come forward and save everyone the time and effort to inspect all these properties. Do the landlords even have a list of all the rental properties in town? If they do not have a list, then the city would have to create and maintain a list, if only for the purpose of “educating” them, let alone finding the properties with appalling conditions – all those bad apples that the “rental industry” tells us about. NB. One might also, while we are at it, ask that the city approach the Health Department to demand that it stop the health and safety inspections of restaurants. Instead the Health Department can establish a website where a checklist for restaurants will be posted so that diners can carry out their own inspections before having a meal. Would not that inspire confidence in our eateries? We can also get rid of several FTEs [full time equivalents] of food inspectors for additional savings for Whatcom County. Identifying rental properties: As some say, this should not be rocket science. The County Assessor maintains a comprehensive data base of all property owners and their holdings. For those properties for which the mailing address differs from the property address, one can rightly assume that the property is rented. Thus identified, to be exempt, the property owner would have to demonstrate that he or she is, in fact, living at the property. Stiff fines for misrepresentation or failure to register a rental would discourage scofflaws. Of course, creating the data base implies resources. Identifying start-up costs: Anything short of a licensing and inspection program is essentially ineffective, so I will not dwell on the costs of any lesser measures. It is preferable that the Council do nothing at all rather than adopt a program that places a thin veneer over the issue that gives the appearance of having done something substantial for the health and safety of our renters. Again, I would refer the committee and the Council to the City of Pasco where they have already have done all this preparatory work and whose code enforcement officer has already indicated to me his willingness to assist us. The fact that we are facing tough budget times is no reason to be timid before a health and safety issue. The cost for the portion of an FTE needed to establish the data base of landlords probably could have been covered by the price of the new truck that was recently bought for the Neighborhood Compliance Officer. The city might also look to volunteers to assist in scrubbing the Whatcom Assessor’s property records to establish a Bellingham rental data base for licensing purposes. I would volunteer and might easily find several others to join me in the project. Looking for meaning in data on complaints to date: Some on the committee seek to find meaning in the statistics on property related complaints filed over the past several years. The assumption is that these complaints are indicative of the problem so that lack of complaints equals lack of problem. More confusing is that the reporting on complaints mixes all sorts of property issues such as lack of permits and violations of various and unrelated city codes. The number of complaints about dangerous conditions in rentals is, therefore, extremely small in number but given the inability of renters to recognize dangerous situations and their reticence in making a complaint to the city, this is not surprising. Having only a handful of complaints each year on a rental stock of 17,000 units should be a surprise to all. That either means that we have a pristine rental market or, as the CDC report says: complaint based systems do not work and we have a hidden problem. You chose the most plausible. As the celebrated scientist Carl Sagan once declared, “Absence of evidence is not evidence of absence.” The Council would do well not to draw conclusions from this gloubi boulga of limited statistics. At the end of the session, the committee gave directions to staff. The first was to explore the use of the current system of licensing business to license rental properties. The second was to explore the strengthening of enforcement of current codes through civil warrants and targetted enforcement against problem properties. Staff is also looking into a program of educating tenants, placing anti-retaliatory language (landlord against tenant) in the city code, and using the data base of properties in the Planning Department to track additional data. Unfortunately, many of the "solutions" discussed by the committee continue to place the onus on the tenant to learn, to recognize and then to report. These expectations are unrealistic and serve no purpose other than to absolve the landlords of their responsibilities. Rental licensing will be the topic of a work session of the Planning/Neighborhoods and Community Development Committee of the Bellingham City Council on Wednesday, October 27th from 10:30 to 11:30 a.m. in the City Council chamber. Members of the committee are Terry Bornemann, Jack Weiss, Seth Fleetwood and Michael Lilliquist. The council last took up the issue of rental licensing at its meeting on May 24th at which time it directed staff to schedule a committee work session. I encourage those who support rental licensing and inspection to attend this work session. Although public comment is not allowed during committee sessions, it is important for the council to know by your attendance that the public is interested in and supports rental licensing and inspections. Citizen presence at the committee session will also provide valuable information for those who plan to comment during a subsequent city council meeting at which the topic will be brought before the council as a whole. The date for such discussions has yet to be set. NWCitizen.com will host a candidate forum in Bellingham on Wednesday, October 13th from 7-9:45 pm in the County Council Chambers of the Whatcom County Court House. 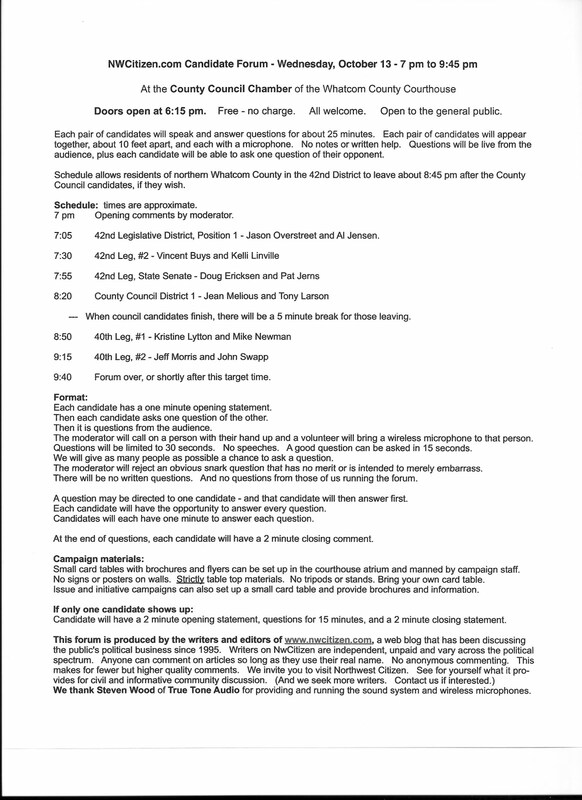 Candidates appearing will be from the 40th (Legislative) and 42nd (Legislative and Senate) districts as well as the Whatcom County Council, District 1. Click on the information sheet image on the left for details. Additional information also available at NWCitizen. Click here. I am writing this letter to request clarification of comments made by you and Mr. Tim Stewart at the 24 May meeting of the Planning/Neighborhoods and Community Development Committee. Having attended the session in Council chambers and having reviewed the video of the proceedings several times, I am very much troubled by your statements. You and Mr. Stewart implied somewhat obliquely that the city of Auburn, WA had tried licensing program of some sort but that there were serious problems especially in single family areas. At one point in the rather confused exchange, you did very briefly interject that Auburn had not done inspections; however, there was the clear connotation that there was something to learn from their experience. As you well know, in spite of Mr. Stewart’s comments and his reference to conversations with former Auburn employee, Mr. Jim Tinner, there is not now nor has there ever been a rental inspection program in Auburn. I talked to several people in their planning department who indicated that they have rental licensing only, at $50 a license. Embedded in their licensing code is language pertaining to continuing criminal or nuisance activities within rentals and that is the issue for which Auburn will take action against a landlord. 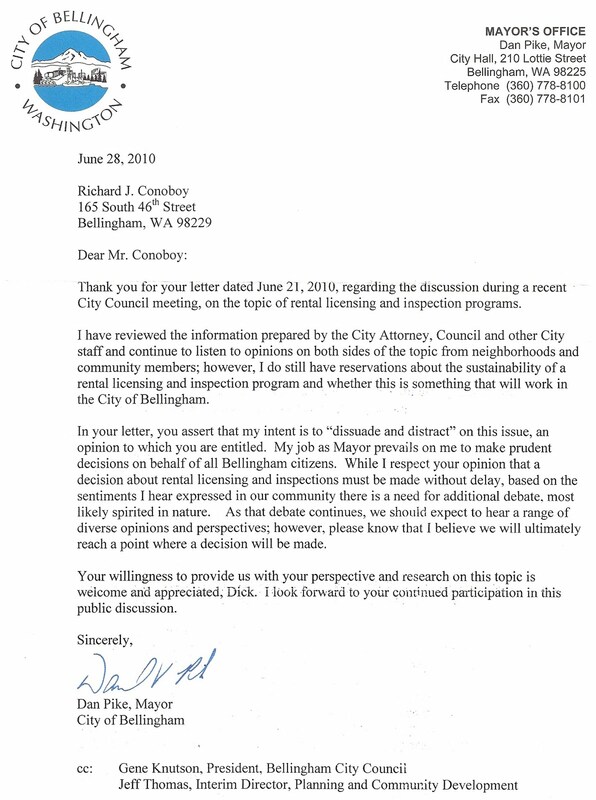 To compare the licensing program in Auburn with or to suggest that there is some similarity to the inspection program we are discussing in Bellingham is disingenuous. Even their licensing application contains the phrase: “The issuance of this business license does not imply compliance with the Zoning Code and International Fire and Building Codes.” (See attachment 1 by clicking here) I have also enclosed for your information the Auburn code portion on rental licensing (see attachment 2 by clicking here). As you will note, there are no provisions for self-certification and no mandatory safety/health inspections. Moreover, I find your reference to the city of Auburn to be somewhat of a stretch. That you would select this city as an example while ignoring the city of Pasco, WA and its long term, successful program raises concerns of cherry-picking examples. In spite of your declaration to the contrary, both cities have sizable migrant populations. They have seasonal workers and we have 8,500 off-campus students from Western, not to mention thousands more from BTC and WCC who are off-campus. Furthermore, the Pasco program has survived several challenges in court. While I have found over one hundred cities (see attachment 3 by clicking here) with working rental licensing and inspection programs, I have tried but have yet to find one example of a program that was overturned on any grounds other than excessive licensing fees. You also indicated you had reservations with respect to privacy, although it was difficult to discern whether or not you were referring to the single family zoning issue or to licensing and inspection of rentals. This difficulty was caused by your seemingly purposeful tendency to mix the arguments on illegal rooming houses with that of rental licensing. No doubt that produces confusion before the Council and surely before the citizenry who should expect a clearer delineation of the facts from their Mayor. You will note that with respect to inspections, current state landlord/tenant law already allows a landlord to enter the premises with a 48 hour notice. A recent, 2010, addition to the RCW, Bill 6459 (see attachment 7 by clicking here) not only recognized the rights of municipalities to have rental licensing and inspections but also provides for administrative search warrants in the event the landlord or the tenant refuses entry for inspections. I am providing a copy of this letter to the City Council and expect that at the next working session of the Planning/Neighborhoods and Community Development Committee, you address these topics in a forthright manner to clear u p the ambiguities and misstatements stemming from your 24 May remarks." The Mayor replied to my letter on 28 June. Click on the image at left to read his non -responsive missive which speaks for itself. Removal of lead based paint is a hazardous process. Identifying the presence of lead based paint is not for amateurs, be they landlords or renters. Nor is it for amateurs to identify structural, electric, plumbing, ventilation and mold problems, which is the reason we need rental licensing and inspection in Bellingham. I call on the City Council and the Mayor to place lead paint contamination on the list of items to be inspected in a comprehensive rental licensing and inspection code.